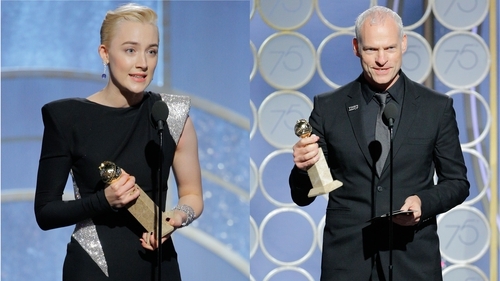 It was a great night for the Irish at the Golden Globe Awards in Beverly Hills, with Lady Bird star Saoirse Ronan and Three Billboards Outside Ebbing, Missouri, writer-director Martin McDonagh among the winners. Ronan, who was previously nominated for Golden Globes for her roles in Brooklyn and Atonement, won the Best Actress - Musical or Comedy award for her performance in writer-director Greta Gerwig's coming-of-age story. Lady Bird was also named Best Motion Picture - Musical or Comedy at the awards. Nominated in six categories, Martin McDonagh's Three Billboards Outside Ebbing, Missouri was the biggest film winner on the night, winning four awards, including Best Motion Picture - Drama. London-Irish filmmaker McDonagh also won the Best Screenplay award for his searing study of grief, with two of his stars, Frances McDormand and Sam Rockwell, winning Best Actress - Drama and Best Supporting Actor respectively for their performances. McDonagh lost out on Best Director to The Shape of Water's Guillermo del Toro. Accepting her award, Ronan said: "My mam's on FaceTime over there on someone's phone right now, so hi!" "I just want to say how inspirational it's been to be in this room," she continued on a night when the stars took a stand against harassment in the entertainment industry. Ronan then thanked "all of the women who I love so much in my own life who support me every single day". "It's my mum's birthday tomorrow; she likes this kind of thing," said Martin McDonagh, accepting his award. "So happy birthday, mum - even though I think she wanted Lady Bird to win!" Gary Oldman won Best Actor - Drama for his portrayal of Winston Churchill in WWII biopic Darkest Hour, while Allison Janney won Best Supporting Actress for her portrayal of LaVona Golden, the mother of disgraced figure skater Tonya Harding, in I, Tonya. Actor-director James Franco was the Best Actor - Musical or Comedy winner for his film, The Disaster Artist. In the television categories, Big Little Lies was the big winner with four awards. There was disappointment for Irish Outlander star Caitriona Balfe, who lost out in the Best Actress in a TV Series - Drama category to The Handmaid's Tale's Elisabeth Moss. On the night, Balfe revealed that she is engaged. The Golden Globes are on RTÉ2 on Monday night from 9pm.